I love recipes that list items like 'lemongrass syrup' and 'Kaffir lime vodka' which until recently only seemed to be available in Harvey Nicks when the moon is in its fourth cycle and Sagittarius is in the ascendant. They really make you feel like you can just jump in and make the cocktail. 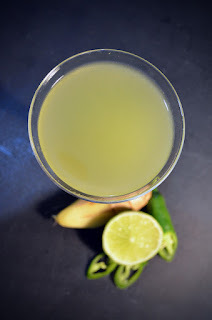 If like me you fancy making a Thai inspired cocktail like my Tom Yum martini, or this Tom Yum Mojito (from which it was inspired) then one option would be to make your own kaffir lime infused vodka. Failing that (and if you want to drink the thing in less than a week) you could always take the deliciously easy shortcut of making your own lemongrass and kaffir lime syrup. A slice of chilli and a squeeze of lime later your liver will be in Koh Samui and you'll be wondering why anyone would bother infusing vodka with anything. Can't help but wonder what a few drops of fish sauce would do to the flavour - then it would really be a la tom yum. Kiffir lime leaves - available in the spice section of Waitrose for £1.79.